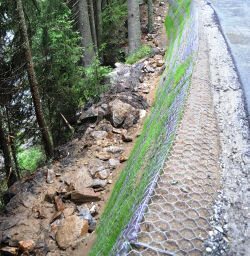 Maccaferri contributed to the reconstruction of the road III/16910 between Srni- Modrava- Filipova Hut in total length of 730m. The maximal height of soil reinforced structure is 4,5m. Installation was done in National park of Šumava, this one together with the neighbouring Bavarian Forest creates the most extensive forest landscape in Central Europe, called the “Green Roof of Europe”. The National Park is a unique scientific laboratory, enabling the monitoring of natural processes at a level which is unfeasible elsewhere. Since 1990 it has been the protected Biospherical Reserve of UNESCO. The National Park of Sumava is located in the South Bohemian Regions of the Czech Republic along the border with Germany and the road built represents the main access to this region, an important tourist attractive location.